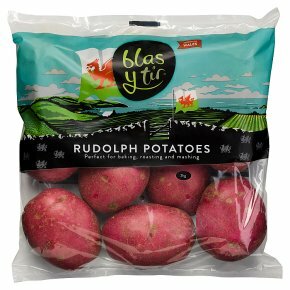 Ideal for baking, roasting and mashing.Enjoy the finest 'taste of the land' with our irresistibly Welsh Rudolph Potatoes. Grown on rich farmland along the Pembrokeshire coast and the Wye Valley and packed in Haverfordwest, our premium quality Rudolph potatoes are irresistibly Welsh. Rudolph Potatoes are great for: Baking; rub some oil over the skin and sprinkle with salt and pepper. Bake for an hour in a preheated oven, 200°C or Gas Mark 6. When cooked, add your favourite filling. Roasting; peel, rinse and chunk potatoes. Parboil in boiling water for 5 minutes then drain. Place in a roasting tin with 4-5 tbsp of hot oil and cook in a pre-heated oven at 190°C/375°F/Gas Mark 5 for around 45-60 minutes, baste occasionally until cooked. Mashing; peel, rinse and place potatoes in lightly salted boiling water, cover and simmer for 20 minutes or until tender. Add milk and mash until smooth. Deep red Rudolph potatoes are perfect for baking, roasting or mashing. With their creamy-smooth texture, they're fluffy enough to eat without added butter, making them the perfect healthy treat. For a little indulgence why not try them roasted with a sprinkle of your favourite herbs. Wash before use. Parboil for 20 mins. Drain; add milk and mash until smooth. Baking; bake for an hour in a preheated oven 200�C/Gas Mark 6. When cooked add your favourite filling.Roasting; peel, rinse and chunk potatoes. Parboil for 10 mins. Drain and coat in oil. Roast in preheated oven 200�C/Gas Mark 6 for about 45 mins.